If you need to locate your Briggs & Stratton model number and serial number, we can help! 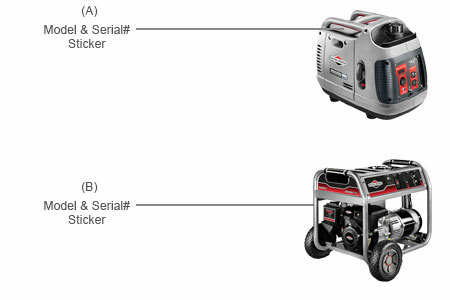 Find your Briggs & Stratton equipment below to see model and serial number locations. The model & serial number on a Briggs & Stratton inverter generator is located on the top of the generator underneath the handle. The model & serial number on a Briggs & Stratton portable generator is located on the inner side of the frame, next to the engine. Look up your Briggs & Stratton generator parts. 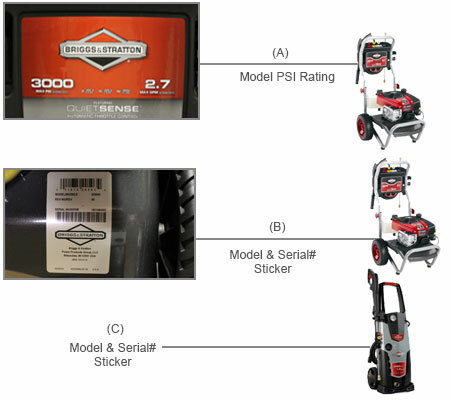 The PSI and GPM Rating on a Briggs & Stratton pressure washer will be located on the front of the unit. The model & serial number on a Briggs & Stratton pressure washer is located behind the unit, on the lower frame. The model & serial number on a Briggs & Stratton electric pressure washer is located on the back of the unit. Look up your Briggs & Stratton pressure washer parts.